I love Lucien…keep it!!! !I look forward to the show…it’s really the only show I watch and look forward to each week. I love the show. The writing is excellent. The casting is superb. One of the best shows for me. I watch it on Amazon, sorry I can’t help with the ratings, but the show must “go on”. Well done to all the production team. Please don’t cancel lucifer. I only recently found out it is on Fox. I have been watchung on amazon, love this show. I will be watchung on Fox from now on to help keep the ratings up! I absolutely love the show. Its humor and cast make it a must on my weekly tv schedule. It would be a huge disappointment if it was cancelled. It makes me laugh and the story lines are great. Want this show to continue for 100 seasons or more. This show better last for a very long time. 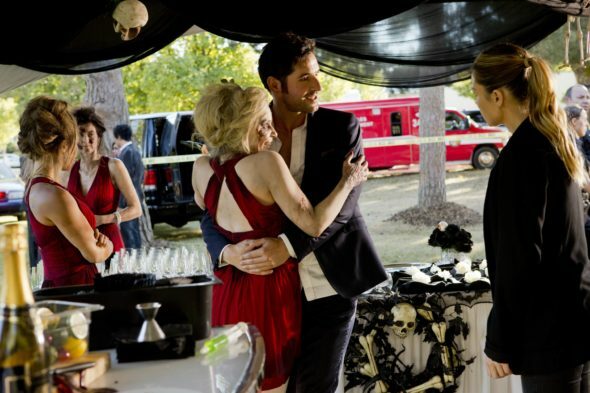 I Love this show ..Great cast…Great storyline..Keep them coming…I want to see Lucifer and Chloe together. Lucifer is an awesome Show!! Can’t wait to watch again next week!